There has been continued evidence that some patients with Major Depressive Disorder also experience symptoms that are below the diagnostic threshold for hypomania. Major depressive disorder (MDD) associated with subthreshold hypomanic symptoms (mixed features) has been identified as a distinct nosological entity in the Diagnostic and Statistical Manual of Mental Disorders, Fifth Edition (DSM-5). In a publication in the Progress in Neuro-Psychopharmacology and Biological Psychiatry, Dr. Steven Targum and Dr. Cara Pendergrass identified the predominant “manic” symptoms endorsed by patients with MDD with mixed features. 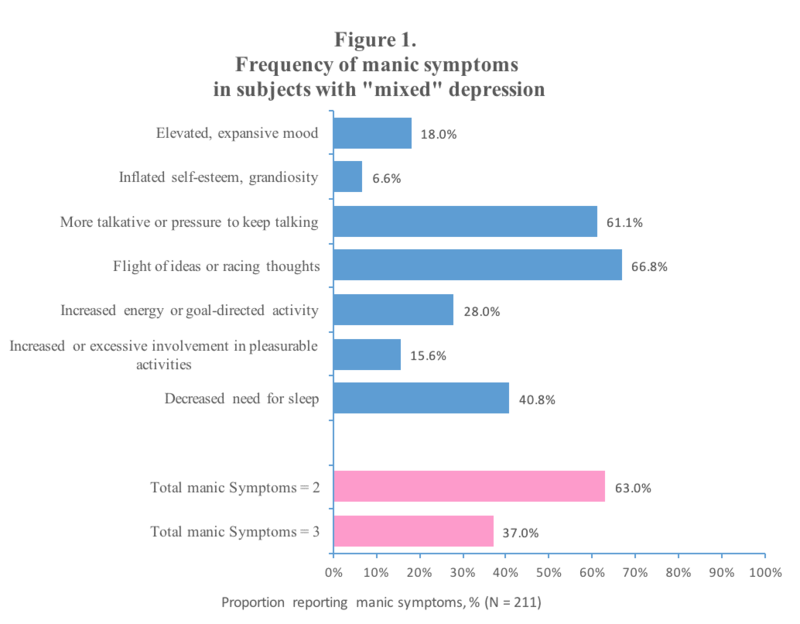 In the examination of clinical characteristics, racing thoughts and increased talkativeness were identified as the two most prominent manic symptoms reported by over 60% of patients with a decreased need for sleep reported by over 40% of patients with MDD with “mixed” features. Data also revealed that irritability and distractibility were reported as often as increased talkativeness and flight of ideas and suggested that these symptoms definitely co-exist within the “mixed” depression patient population. However, the DSM-5 criteria specifically exclude psychomotor agitation, irritable mood, and distractibility from the diagnostic criteria for the mixed features specifier stating that these symptoms may overlap with acute depression as part of a major depressive episode. The authors concluded that a four- or five-symptom cluster characterized the manic presentation in the majority of patients diagnosed as having MDD with “mixed” features in this first placebo.